Organic tapioca syrup is a natural liquid sweetener made from tapioca starch. This clear, neutral-flavoured syrup adds sweetness to various foods and is used as an alternative to sucrose. This sweetener is extensively used in confectioneries, baking products and beverages for its ability to provide neutral base, which is free from any distinct colour or flavour. This can also be applied for imparting rich flavour to food products. The syrup has a very high solubility and is able to release energy almost instantaneously through the balanced distribution of simple and complex carbohydrate components. The composition of tapioca syrup is similar to that of sucrose, but it definitely possesses higher nutritional value than sugar crystals. Tapioca syrup solids are slightly sweet, white or off-white coloured powder that are often used for bulking, through balancing of water activity and solid adjustments. This fine powder has a faint sweet aroma and enables solid bulking without using high amount of sugar. Tapioca solid is used for making beverages, yogurt, pudding, ice cream, infant rehydration formulas and many other products. The powder is hypo-allergic in nature and promotes good freeze-thaw stability. This can impart nice brown colour in food products and is compressible enough for acting as carrier in tablet applications. Tapioca syrups provide many health benefits for their lower calories and carbohydrate contents and zero exposure to pesticides and genetic modifications. This gluten free product is low in carbohydrate content compared to sucrose. A quarter cup of tapioca syrup serving contains only 42 grams of carbohydrate in contrast to 50 grams of carbohydrate content of sugar. This amount of carbohydrate in tapioca syrup is sufficient for supplying energy, and is also helpful in reducing the blood sugar level. Similarly, this syrup is lower in calories, too. A quarter cup of the tapioca syrup contains 168 calories, compared to 194 calories of energy contained in similar size of sugar serving. This small amount of calorie difference may sound negligible, but the cumulative amount of calorie cut over the year may result in significant weight loss. Therefore organic tapioca syrup nutrition is always better and many people use it as healthy alternative to popular sweeteners. 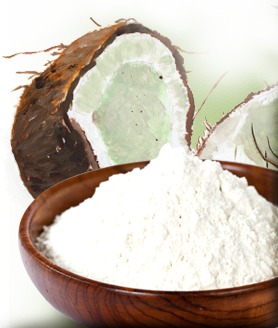 Tapioca starch is an organic product that is extracted from cassava or yucca roots, which are developed by the organic farmers. Unlike the traditional farmers, the organic farmers do not use any pesticides, but follow the procedure of crop rotation to control weeds. They use natural predators, like birds for controlling insects. Also, the sugar crops are never genetically modified. Though the side-effects of consuming genetically modified crops are not yet completely known, it is better to avoid them for bypassing allergy and other immunity-related health problems. Tapioca syrup provides great alternative for corn syrup, maple syrup, honey or sugars. This syrup is also used in cooking and as binding agent. For example, the syrup is used for retaining adequate moisture level in processed meats. The tapioca pearls extracted from cassava tubers are used for garnishing pies and other desserts. This can also be used in homemade drinks and smoothies for the neutral flavour it imparts to them. The syrup is commercially used for making breakfast bars, cereals and fruit drinks. It is always recommended to buy organic tapioca syrup and enjoy nature’s original flavour in your food and beverages.